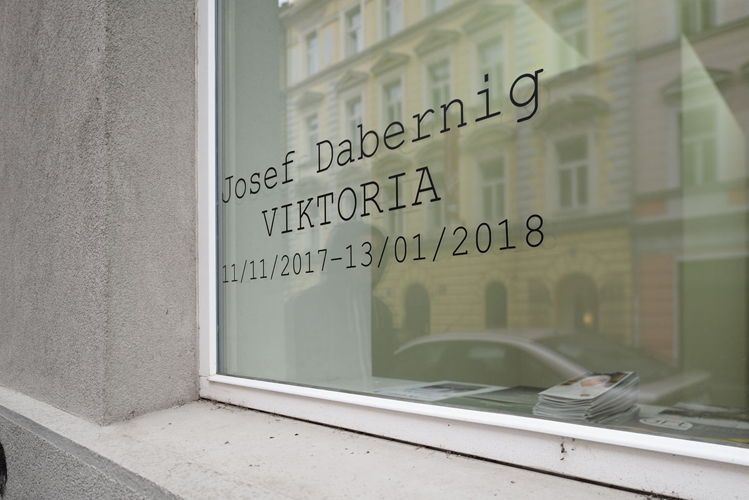 VIKTORIA, the title chosen by Josef Dabernig for this exhibition, reflects the variety and variability of interpretations that feed his poetics. It’s an umbrella title, deliberately ambiguous in its various meanings. Viktoria is a feminine name, widely used in Scandinavian and German languages. At the same time, it is a word akin to the English “victory” or the Italian “vittoria”, which – in both cases – define the act of winning, overcoming an opponent in a clash or sports competition. 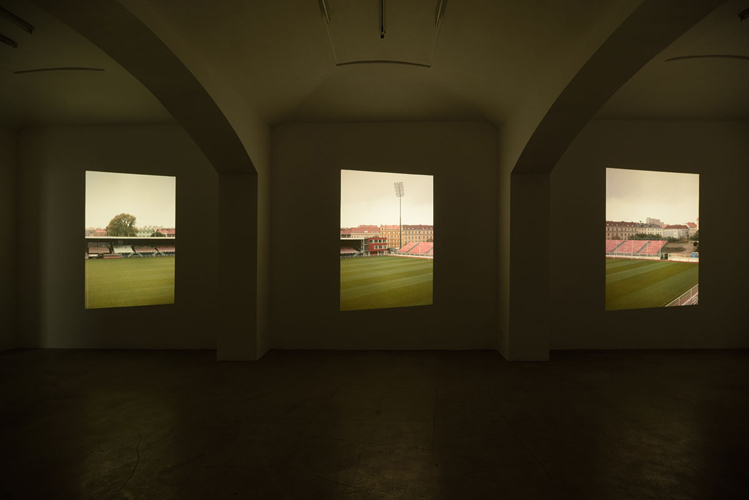 Finally, Viktoria is the name of the stadium in Prague, the city hosting this exhibition as well as the subject of the FK Viktoria Stadium series (2016); the first photographic work exhibited by the artist in the form of slides with a projection on three synchronized channels. Curiously, even Wisla – Josef Dabernig’s debut behind the camera made in 1996 – has the title of the stadium’s name in Krakow where the film was shot. The arena, the stadium and football are recurring subjects in the artistic practice of Dabernig, attracted by their dramaturgical potential. The stadium, like a gym, is a stage that from time to time becomes active. However, in times of inactivity, it is a particular architectural object. If a gym is a closed space, the stadium is a monumental public architecture inserted in an urban landscape. 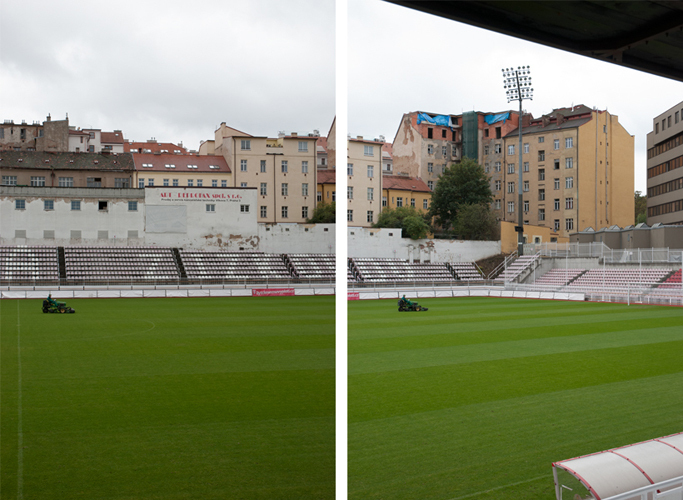 From 1993 Dabernig has been constantly taking pictures, during his journeys, of stadiums and sports fields, by collecting this series of photographs under the title Panorama. Naples, Pozzuoli, Vilnius, Graz, Krakow, Cairo, Santiago, Senegal, Saint Petersburg, Mexico City, Sao Paulo, Yerevan, Tbilisi, Lviv, and Kiev are just some of the cities that make up the background to these images. In some cases (such as in Prague) the artist has returned to immortalize the same place, to observe its decay or renewal. He does not choose stadiums which are representative of today’s show-business, of the entertainment world, of archi-stars, of stock-listed football clubs. The attention of Dabernig is instead oriented towards outlying, derelict or abandoned stadiums in provincial towns – especially in Eastern Europe – an emblem of the failure of political and social bodies in power over the last thirty years. The arena thus becomes a key to observing global geo-political changes. 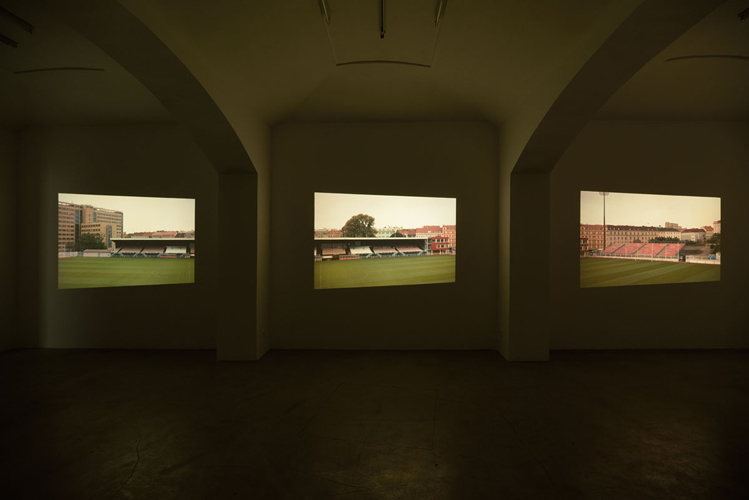 If Josef as an individual is a fierce football enthusiast, the artist Dabernig does not show interest in sport in itself, nor in its possible representation. The stadium is used as a device for watching, not with its standard function (ie that of assisting live at a sporting event) but as a passe-partout to explore the marginal space inside and outside the image and the subject represented. Josef Dabernig is a methodical, analytic artist who does not seem to consider – as opposed to many contemporary artists – improvisation as an added value. However he builds parameters that allow him to “cross borders”. The Panorama photos are taken with a methodology in which the author tends to limit his subjectivity as much as possible, reducing the photographic gesture to the minimum through a precise compositional process. 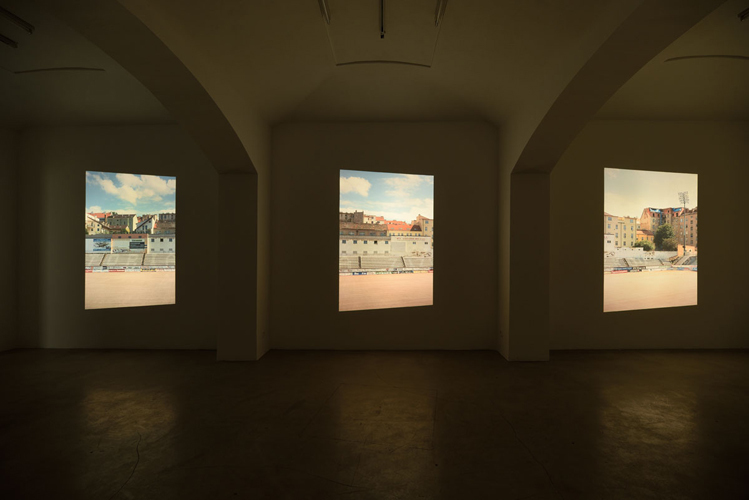 He positions himself in the centre of the arena and shoots pictures to the right, left and centre to create a decomposed 180 degrees panorama. Except for a few exceptions, the stadiums appear as empty stages devoid of actors and spectators. Places suspended in an indefinite temporality other than the one enclosed in the architecture around them. It is no coincidence that the artist always shoots the photos at such a height not to limit the view only to the stadium, allowing it to contextualize it in the urban environment that contains it. Like many other works, the Panorama series is produced with modest means, with no post-production effects. Dabernig presents them in extremely profane frames and in displays never over the top. A poetic language that escapes from any ostentation typical of the contemporary world, declaring itself deliberately and provocatively proletarian. If in Panorama the void and the emptiness of the picture is filled by the spectator’s eye, films always see the artist’s participation in the dual role of actor/author. 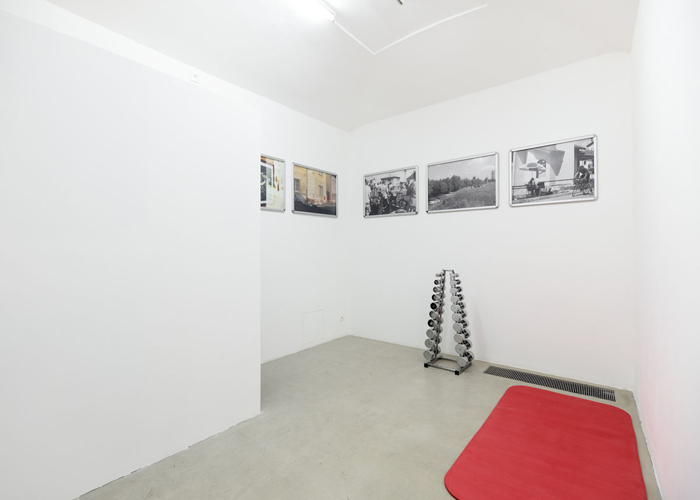 It is the case of excursus on fitness, produced – along with another group of works– on occasion of his solo namesake exhibition held at the MAK in Vienna in 2010. In the second room of the gallery, the exhibition of the MAK is being restaged in a reduced version and readapted into a kind of cabinet. 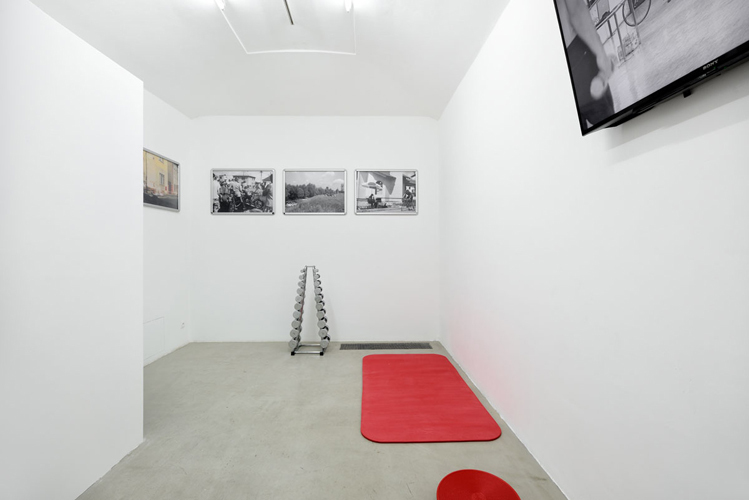 An environment densely populated by sculptures, photographs and a movie that suggests the atmosphere of a gym. Dabernig’s films are based on scripts literally executed with camera movements often dictated by pre-defined geometries. The artist uses film language in a sculptural way operating in space with specific movements. The tendency to frame reality in analytical and rigorous compositional plots is also evident in the numerous photographic notes that fill his archive and have still not been exhibited until today. Not to mention that one of the first works by the artist (Torvaianica, 1982-83) consisted in the translation of a landscape into a system of signs and numbers, in turn translated into sculptures. Dabernig’s films and photographs share an apparently rigid dramaturgy developed according to minimal narrative structures. However, such methodical and conceptual rigor is counterbalanced by an ironic element that underlies many works, especially filmic ones. Excursus on Fitness is a silent film about 11 minutes long, shot in black and white. The set is a gym where we see a series of characters portrayed in the act of performing fitness exercises, except for a male figure sitting at a table in front of a computer. The six people, while sharing the same space, seem to ignore each other; everyone is intent on performing diligently their own gymnastics. The camera sometimes films them individually, sometimes in groups. A precise choreography where performers perform simple, almost clumsy gestures, inside a gym whose windows look out over a typical Viennese social housing architecture. Dabernig himself appears in the film with his wife Isabella, her daughter Anna and his brother Wolfgang, another recurring character of his films. Curiously, the artist chooses not to entrust to himself the role of orchestra director of this family gathering. The role of the director or rather of the meta-director is delegated to the artist Otto Zitko standing behind the computer on whose screen, towards the end of the movie, we can watch the script of the film itself in a Godard-like tautology of “film inside the film”. The absence of a real plot in Excursus on Fitness could be symbolically associated with the empty arena in the Panorama series. 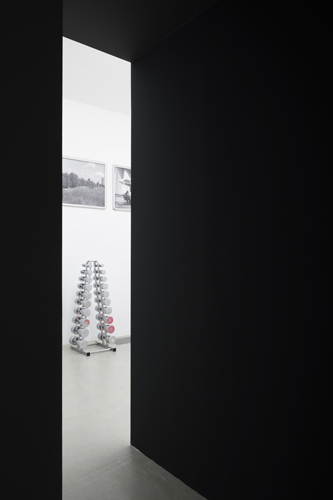 It’s exactly that suspension, to act as a common denominator in many of Dabernig’s works, who, in fact, affirmed “the virtually missing plot is probably the main motive in my work and is related to the idea of desire and expectation. The productive significance of the void may have different reasons, for me it is essentially a lack of content. It is like the exact construction of nothing; very clear in form, very open in meaning “.